James Bond - The Secret Agent: Do you shower like James Bond? 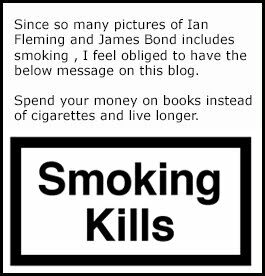 One of the blogs readers sent me a very interesting article on how James Bond showers in the books. In the first James Bond novel Casino Royale 007 takes no less then four showers and they all have one thing in common. They are very cold. The below pass is from the beginning of chapter eight. "BOND WALKED up to his room, which again showed no sign of trespass, threw off his clothes, took a long hot bath followed by an ice-cold shower and lay down on his bed." Every time I read that James Bond takes a cold shower, or as they are later called a Scottish shower, I wonder why? I guess I wonder that since I live in Sweden and we have a very long cold period of the year were a hot shower always is preferable. But in that article I was sent there is many good explanations on why you should take cold showers instead of warm ones. Below is some extracts from the article. Hot water dries out your skin by stripping it of beneficial natural oils. It can even cause your skin to produce additional unwanted oil to compensate for the sudden dryness. Cold water tightens your skin and constricts blood vessels. This reduces the appearance of pores and reduces swelling and dark circles under your eyes. With cold water, your hair appears healthier and shinier because it flattens your hair follicles and allows them to better grip your scalp. After a cold shower, your body reacts to the temperature change by trying to warm itself. Your metabolic rates increase and the body kick-starts its natural bug-fighting defense system with a rapid release of white blood cells. Studies by Professor Vijay Kakkar, the founder of the Thrombosis Research Institute in London, show that circulation is increased and the body ramps up immune cell production when exposed to cold water for short periods of time. Cold showers can, however, increase natural levels of testosterone by up to 17%. Research shows that hot water exposure puts your reproductive system into cooling mode, dropping the testicles in an attempt to keep them away from heat. Cold water allows your boys to stay at a temperature more conducive to proper testosterone production. According to a 2009 study published in the New England Journal of Medicine, brown fat cells in study participants were increased up to 15 times after frequently taking cold showers. Wait a minute—fat cells were increased? I know what you’re thinking, but this increase in fat is actually a good thing. The body has two types of fat tissue—white and brown cells. White cells are the type responsible for love handles and the buildup of fat on the stomach and neck. Brown cells are packed with mitochondria, the energy center of cells, and can be burned for energy to keep us warm. When the body is producing brown cells at an increased level, we more easily reduce the build up of white cells that occur during a caloric surplus. In fact, that same 2009 study found that participant had the potential to lose up to nine additional pounds of fat per year by simply taking cold showers. After reading the article I have started testing cold showers and it works quite good. They are more eco-friendly and you do wish to get the hell out of there much quicker so it saves water as well. So shower James Bond style. Both your body and your children's children will thank you for it.